The inhabitants of Los Llanos de Aridane on La Palma were amazed last Saturday, when suddenly in the morning a huge mountain of rubbish appeared in the middle of the Plaza de España. A total of 353 kilograms of garbage - as much as is thrown into the grey bins per capita in a year. The island's rubbish collection service and the local council have jointly launched this campaign to make the inhabitants aware of the amount, above all "because half of it should not end up in the residual waste bin, but should be recycled via other containers or certain specific delivery points. 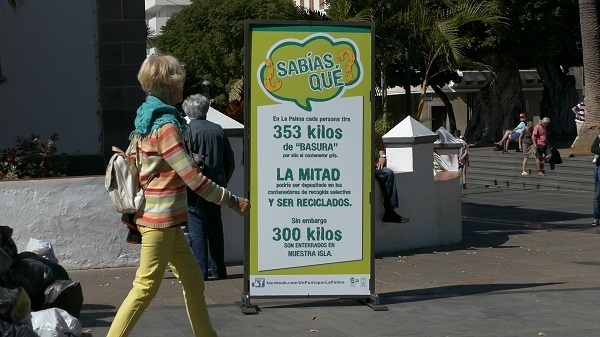 We want to raise awareness about waste separation," explained the director of the consortium Álvaro Duque. Produced with news.CMS in 0,0610 seconds.